Mobile work is an increasingly crucial part of their day-to-day business. This, coupled with the larger number of connectivity types that exist today and an increasing reliance on applications such as e-mail and SharePoint, have created a very challenging environment for corporate IT departments to support effectively. Mobile WAN optimization technology can help improve the performance of these key applications, no matter where the user is located or how the worker is connected. 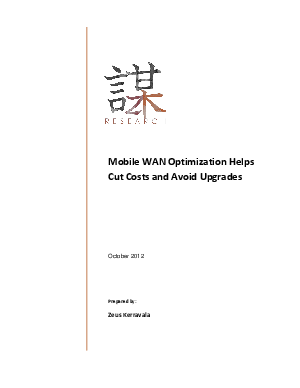 Additionally, mobile WAN optimization can be used to defer many expensive network and hardware upgrades while reducing the cost of supporting the mobile workers.